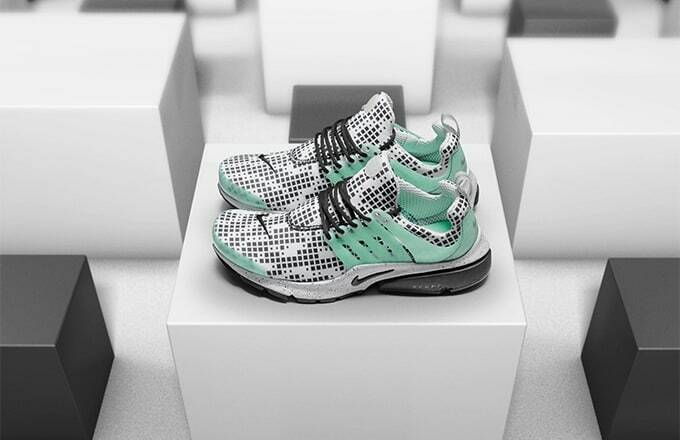 For a while now Nike have been going in hard with a string of stellar Air Presto releases, the classic '90s performance shoe has seen a recent revival that has got old and new school sneakerheads salivating at the mouth. Their latest release comes in the form of the Air Presto GPX ‘Pixel’ pattern. The Pixel-patterned Prestos will be dropping the same month as it’s ‘Tropical’ edition counterpart. As the most recent edition to the GPX range the ‘Pixel’ concept shares its predecessors love a of strong graphical presence by using a square patterned design across the entirety of the sneaker's upper. Additionally, a translucent green glow is present on the lace cage and the front toe box, whilst the speckled midsole and black sole add a depth of contrast, ensuring another sure fire hit for the month. The Nike Air Presto GPX ‘Pixel’ will be available March 4 in select retailers and webstores like Footpatrol. Customers who pick up the sneakers in-store at Footpatrol will also receive a limited edition tote bag and a glow in the dark sticker. For a detailed look at the Nike Air Presto GPX ’Pixel’ check out our gallery below.